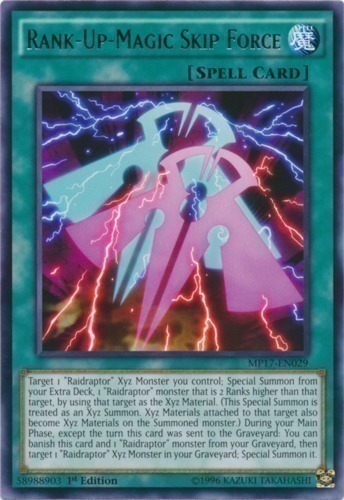 Target 1 "Raidraptor" Xyz Monster you control; Special Summon from your Extra Deck, 1 "Raidraptor" monster that is 2 Ranks higher than that target, by using that target as the Xyz Material. (This Special Summon is treated as an Xyz Summon. Xyz Materials attached to that target also become Xyz Materials on the Summoned monster.) During your Main Phase, except the turn this card was sent to the Graveyard: You can banish this card and 1 "Raidraptor" monster from your Graveyard, then target 1 "Raidraptor" Xyz Monster in your Graveyard; Special Summon it.